Hybrid Liquid Cooling, Innovative Next Gen Solution. Unites the Best Of Air and Liquid. Traditional Liquid CLC lacks critical airflow around the CPU. 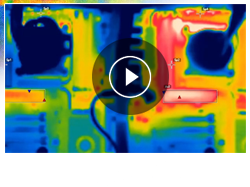 During high load computation surrounding components builds up excessive amount of heat. Hybrid Liquid Cooling adds extra airflow circulation effectively cools all surround components. In effect brings higher system stability. The A series Hybrid Liquid Cooling units combine a high performance 5th Gen CLC system along with CRYORIG proprietary Airflow Circulator, the best of both worlds! The Internet of things Enabled, Remote Wake Capable. Next Gen Power Supply Unit. In an attempt to revolutionize the way we manage PC energy use. The CRYORIG Pi PSU unit with it’s embedded WiFi enabled control unit, allows users to remotely control their PSU. Remote on/off along with energy monitoring capabilities allow for a greener and more efficient energy use. With the CRYORIG Pi, you don’t need any tinkering around with ports and IP addresses, a WiFi network is all you need. Our patent pending Zero Hassle Hardware Wake (ZHH Wake) controls the PSU unit and your mainboard on/off pins directly through hardware, the CRYORIG Pi is guaranteed to turn your system on/off at will. Wake up a remote PC to perform remote desktop functions. Remote wake your file sharing or distribution computing PC after a local power outage. Remote close your PC ahead of a thunder storm. The application of the IoT enabled Pi is almost limitless. The CRYORIG Pi can be easily controlled by CRYORIG’s Pi App on both Android and iOS systems. With the CRYORIG Pi App, users can remotely control their PSU’s with just one click of a button. Future software revision plans include further IoT functions such as power monitoring and energy use calculations, as well as calculating monthly energy cost. The CYRORIG Pi is your best companion in easy smart energy management.